Meditation can be defined as a state of consciousness characterized by stillness and inner calm. The ultimate goal is the attainment of supreme spiritual peace. Meditation takes you beyond the restless activity of the mind to a deeper, more peaceful space. Meditation is mental maintenance. The mind needs to be stilled occasionally to keep it working at peak efficiency. Teaching yourself how to relax your mind and release it from the stress of thought for a short period each day keeps it clear and clean. You'll think better. You'll see more accurately and with more insight. You'll be able to concentrate and focus on things like never before. You'll be able to truly relax. Meditation differs from deep sleep or relaxation in that it involves active mental effort rather than total rest. As well as relieving stress and replenishing energy, it can bring you physical, mental, and spiritual peace. You will develop awareness - the capacity to notice fully every event in your life as it happens. Although you don't need to formally meditate in order to practice yoga; nor is the practice of yoga mandatory in order to meditate - the two practices support one another. Through the practice of yoga, you enhance both your abilities to concentrate and to relax - the two most important requirements for meditation. The practice of yoga is a stepping stone toward successful meditation. The first requirement of meditation is the power to concentrate. The objective is to direct the mind to dwell exclusively on one subject. While the subject of attention may vary, all forms of meditation have as their goal the centering or focusing of one's attention, or mental energies. Through focusing your attention upon a single subject, there is an integration of the mind, body and present moment, and your capacity to attend to one moment at a time with clarity and sensitivity is enhanced. Regular meditation practice instills a sense of living in the present moment - facing pleasant and unpleasant emotions, thought patterns, fears, and cravings without distraction. At first, sitting still may feel strange and you may think you are wasting time. But you really are making excellent use of a relatively short span of time; you are retraining your mind to be more effective and creative. Short periods of inner quiet will refresh your mind and body. Through meditation you can gain new perspectives on life. You could spend a whole lifetime seeking outside yourself for happiness, but in reality it can only be found inside. Meditation helps you to understand yourself. With time, you will discover where your true nature and abilities lie. It will inspire you to find your own creativity and inner resources. You will feel encouraged to get the most benefit out of each day. Like other yogic paths, meditation is nondenominational. Meditative practices are part of many religious traditions. There are several common principles: outwardly, an awareness of posture, breath and mental control; inwardly, a spiritual search. Buddhism is best known for its teaching on meditation, and takes various forms, including Zen. The Islamic Sufi Way, Judaism, Christian mysticism, and many Paths of Yoga also include meditative practices. Meditation requires patience, understanding and practice. Try not to expect any particular result. If you have no expectation, you will not get discouraged and stop practicing, and because you don't stop practicing, you will gradually become more and more comfortable in this different state of meditation. You will look forward to it - like going to meet a good friend or taking a quiet rest. As with learning and perfecting yoga postures, meditation is a lifelong quest. Meditation progress is cumulative; even if you think nothing is happening, the daily effort is increasing your concentration and willpower and helping you to gain control over your mind. Control of the mind is the key to success in life. If you can become the master of this dynamic and vast source of potential energy, you have access to a powerful resource. Meditation is beneficial for everyone, especially those with hectic, stressful lives. It teaches you how to manage stress; which in turn enhances your overall physical health and emotional well-being. In meditation, the overactive mind is calmed and turned inward. 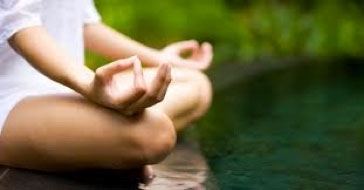 Meditation soothes the nervous system, balances the right and left hemispheres of the brain, centers attention, gives perspective and clarity, improves the powers of concentration, improves memory, improves confidence, gives a sense of purpose, frees the spirit, and increases spiritual strength. Meditation unites mind and body. You can find peace of mind by learning to detach yourself from troubling thoughts. A full and active life with less stress and anxiety promotes restful and refreshing sleep. You will feel more energetic and able to cope with life. The practice of meditation enables you gradually to gain control over your own mind - over the thoughts, dialogs and emotional upsets that revolve incessantly in your mental conversation. This control is tremendously helpful in reducing such debilitating feelings as anger, fear, depression, negativity and boredom. Meditation lowers the rate of metabolism - the rate of using oxygen and producing carbon dioxide. The lactate concentration of the blood decreases sharply also. Blood-lactate level is related to anxiety and tension. The heartbeat tends to slow down. There also tends to be changes in the pattern of brain waves. In meditation, the brain waves are in a different state from those of either waking or sleeping. The most usual report of these changes is an increase of slow alpha waves. Alpha waves are brain waves that are associated with a drowsy state or, in meditation, a very relaxed yet alert and attentive state. In addition both sides of the brain are active. Meditation promotes physical relaxation and calm. A relaxed state is good for the heart and lowers the blood pressure. It has been found to help relieve suffering from angina and arrhythmia and to lower blood cholesterol levels. It decreases perspiration, slows the rate of respiration accompanied by a decrease of metabolic wastes in the bloodstream. It recharges the batteries and increases physical stamina and enhances the immune system. Meditation has been shown to provide other health benefits as well. Diabetics can benefit from meditation. Meditation has been shown to improve the regulation of glucose in patients with adult-onset diabetes. It has been shown to help asthmatics by lessening the emotional reactions that often precede attacks and improve the flow of air in constricted airway passages. It has been shown to lessen the level of pain in chronic pain suffers and thus lower their reliance on pain-killers. The causes of the pain ranged from backaches and headaches (both migraine and tension) to more serious cases seen in pain clinics. Zen asserts that all beings have a Buddha nature – the universal nature of inherent wisdom and virtue – Buddha-nature is nothing other than the nature of the mind itself. The aim of Zen practice is to discover our own Buddha-nature through meditation and mindfulness of daily experiences. This will provide new perspectives and insights on existence, which ultimately lead us to enlightenment. Zen de-emphasizes reliance on religious texts or verbal discourse on metaphysical questions. Zen philosophy holds that these things lead the practitioner to seek external answers rather than searching within for a direct, intuitive perception of Buddha-nature. Zen's non-reliance on written words can be misunderstood as being against the use of words. However, Zen is deeply rooted in scriptural teachings of the Buddha Siddhartha Gautama and in Mahayana Buddhist thought and philosophy. Zen recognizes that the Buddha's awakening came through his meditation practice, not from words that he read or discovered. And it is primarily through meditation that we may awaken to the same insights as the Buddha. This workshop is great for those who are new to meditation and also for those who are looking to refresh their practice. Come discover the many levels of a peaceful mind. It's easy and fun. Zen philosophy enhances other faith-based practices, so it naturally complements any lifestyle. This workshop is led by our senior meditation master with over 23 years experience as an instructor. Let us help you discover how Zen meditation can enrich your life and the lives of those around you.